We recently added this insulation to a customer’s garage door. Isn’t it shiny!? Why should you insulate your garage door? This is a pretty straight forward DIY homeowner project, but there are some things to keep in mind if you take it on yourself. You are adding weight to your garage door when you add insulation. Your opener, springs, etc are all working to support the weight of your door. By adding weight you could add strain and tension to those parts. Depending on your insulation, weight of your door and opener, you might have to make adjustments to your springs or other operating mechanisms to compensate for the added weight. When you add weight you are also putting more strain on your opener, which can make it break down faster. You can also mess with the balance of your garage door when you add insulation. Make sure you re-balance your door when you are done. 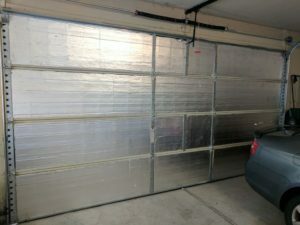 If you still want to DIY your insulation vs having a garage door tech do it for you, you can still save money by doing this and having a garage door company come out and inspect once you are done. They can make any adjustments to your springs, ensure your opener can handle the weight, and re-balance your door. Temperature control is the main reason people choose to insulate their garage door. If you are thinking about working in your garage, setting up a home gym or whatever ideas you have, making sure you are warm in winter and cooler in summer is key. Insulation really helps this! Insulation helps to make your garage door stronger! If you use steel backed insulation, this is even more true! Insulation also is a great noise reducer. If you live on a busy street, insulation can really help cut down on the noise in your garage, and in your home! Give us a call today if you want to learn more about garage door insulation! © 2017 Perfect Solutions Garage Door. All rights reserved.